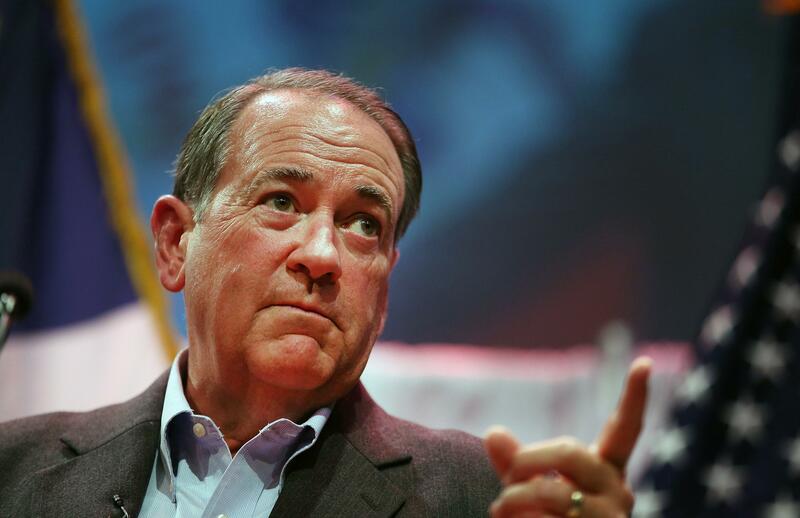 Mike Huckabee-Cedar Rapids Pizza Ranch: How the former Arkansas governor scares voters without being scary. Mike Huckabee speaks to guests gathered at the Point of Grace Church for the Iowa Faith and Freedom Coalition 2015 Spring Kickoff on April 25, 2015 in Waukee, Iowa. CEDAR RAPIDS, Iowa—The applause started with a single man in the corner of a crowded back room in a Pizza Ranch here on Thursday. After a short beat that was still long enough to be awkward, the rest of the room joined in. Mike Huckabee, who had just finished explaining that “our country is in real trouble,” began to chuckle. “You know the joke about the sound of one hand clapping?” he said with a smile. “That was it.” The crowd, which only moments ago had let out a solemn Amen in response to his dire warning about a nation in peril, began to laugh. Once they had stopped, Huckabee picked up where he had left off, describing how the “Washington-to-Wall Street axis of power” had created a government that has put the country on the path to ruin. Huckabee’s 2016 campaign, which officially kicked off on Tuesday, faces a number of pressing questions, chief among them: Can he repeat his surprise victory in the 2008 Iowa Caucus, which was fueled in large part by an Evangelical base that will have significantly more options this time around? And, can the former Arkansas governor raise enough cash to go the distance in a race that will require vastly more of it than the one he had to drop out of seven years ago? The answer to those questions will likely decide whether Huckabee seriously challenges for the Republican nomination next year, but both hinge on another question, which was raised by the Washington Post’s Steve Hendrix earlier this week: “Will the same ‘I’m not mad at anybody’ on-air vibe that fueled his rise make him a non-starter for mad-as-hell early Republican voters?” Translation: Huckabee better get angry, or he risks getting lost. On Thursday, one of the 50 or so Iowans who had turned up at the afternoon meet-and-greet brought a copy of the Post article along and asked Huckabee about it while he was working the room. Huckabee responded by signing the newspaper. A few minutes later the former governor was in the front of the room taking swings. He decried the “the donor class” and their outsized role in elections, and spoke at length about his own experience going toe-to-toe with the “Clinton political machine” during his days as lieutenant governor and governor in Arkansas. His words were angry, but his tone was not. He punctuated most lines with a smile, and occasionally a laugh. His message: I’m as angry as the rest of the GOP field but I don’t need to shout about it. That may not be what conservative voters expect to hear given the current tone in Washington and on the campaign trail, but those in attendance on Thursday seemed more than impressed. They nodded along as Huckabee lamented the national debt, the current tax code, and the demise of the two-parent family. But when it came time to leave, they were more likely to be smiling than screaming mad. Just like the man they had come to see.